1. New catalysts for environmentally friendly synthetic transformations applicable to medicinal (small drug molecules) manufacturing. World is paying increased attention to organic waste produced by chemical enterprise and organic solvents play a considerable role in this regards (R.A. Sheldon. Green Chem. 2007, 9 (12), 1273). Small molecule pharmaceuticals have among the highest E factors in the chemical industry, in the range of 25 to 200. Fine chemicals. Pharmaceutical industry requires more steps in synthesis and higher purity which results in higher waste and higher E factor. Most of the waste is inorganic salt by products and organic solvents (CEN ACS Org , 21, April 2013). Organic solvents account for 80% of the waste generated during typical pharmaceutical processing according to data presented to ACS Green Chemistry Institute’s pharmaceutical roundtable. An important issue in application of green chemistry to pharmaceutical industry is the use of organic solvents. Indeed, so many of the solvents that are favored by organic chemists have been blacklisted that the whole question of solvent use requires rethinking and has become a primary focus, especially in the manufacture of pharmaceuticals. The field of Green Chemistry and Engineering got off the ground based on a concern about chemical toxicity and waste, as well as potential harm to humans and the environment associated with each. Pharmaceutical companies are focusing their effort on minimizing solvent use and in replacement of many traditional organic solvents, such as chlorinated and aromatic hydrocarbons, by more environmentally friendly alternatives. CDS team has been involved in developing Green Chemistry catalysts applicable to pharmaceutical industry. 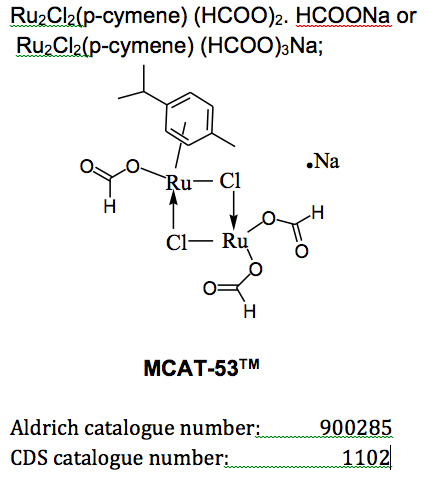 Our front runner catalyst, MCAT- 53™ is a ruthenium based catalyst that is capable of C-H functionalization and coupling. MCAT-53™ has been independently developed through in-house efforts in our labs at Plainfield, Illinois through several years of work (PCT application filed). We maintain a fully functional chemical laboratory at Plainfield. Not only is MCAT-53™ capable of direct C-H functionalization (new emerging area of research) but more importantly, C- H activation and coupling is done in water (green solvent of choice). We are very keen to see further development and widespread use go MCAT-53™ In pharmaceutical industry. We have adoped a very flexible approach to making these catalysts accessible and available for R&D. MCAT-53™ can be purchased for R&D usage directly from Sigma Aldrich here. Salient feature of CDS catalyst MCAT-53™ is that it meets Green Chemistry Principles and is cheaper than existing alternatives. For more information on MCAT-53 read here. 2. Synthetic Metalloporphyrins for Metabolite identification and synthesis. By using our synthetic metalloporphyrin technology, Phase 1 metabolites can be generated in high yield from your molecules. Our method will provide you with the rapid synthesis of metabolites that are identified in vivo and/or ex vivo. Molecularly diverse compounds can be produced that will assist you in your search for discovering new chemical entities (NCEs). This approach affords an efficient method for the systematic preparation and identification of the entire spectrum of metabolites from a chosen drug. We can envision the screening of a series of compounds by reacting them with different permutations of a metalloporphyrin, co-oxidant and a suitable solvent. Reaction conditions that produce the maximum number of metabolites can be defined. This logically leads to a subsequent scaled-up optimal process. The oxidation products can be separated and subjected to toxicologic, pathologic, histopathalogic, or genotoxic testing. More on this can be read here. The compounds resulting from the metalloprophyrin reaction will be isolated, identified and delivered according to customer requirements. Copyright ® Chicago Discovery Solutions. All Rights Reserved.